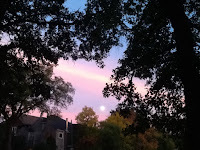 Friday evening, I heard about how the moon would appear this past weekend, and caught a moment to look at it. I saw this gorgeous sunset, and the full moon, bright and round, rose up, looking like the sun in the sky. This photo is a poor approximation of it, but it filled me with a strange sort of awe. Remarkable. I have some fun things planned for the blog in the near future, including a knitting needle review and possibly a give away. Sound interesting? I am also wondering about a way to help raise money to help refugees, which is such a big issue. I'm pondering a sort of "UNsale." It would be a way to purchase downloadable knitting patterns, without a discount, but some portion of the sale would go towards helping others who have been displaced from their homes and need so much, perhaps through the Red Cross. What do you think about that? 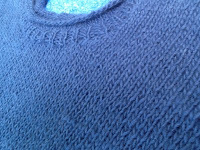 I'd love thoughts from knitter readers--would you buy a pattern that wasn't discounted, but that donated a portion to a reputable charity instead? Finally, the Manitoba Fibre Festival is upon us! It sounds like I will get to spend some time with the fleece display and the knitting relay event-- that is-- when I am not teaching. Please drop by to visit if you're local! The Manitoba Fibre Festival is coming up! It will be October 2nd and 3rd at the Red River Ex in Winnipeg. 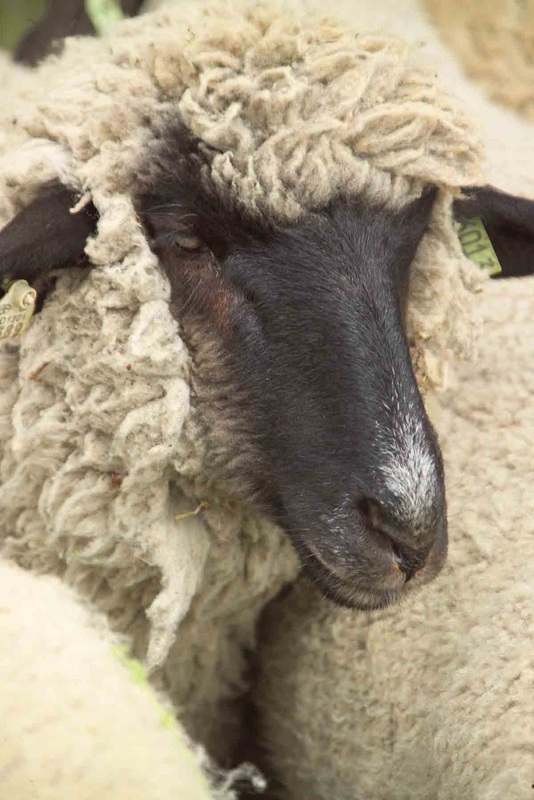 This year is exciting; there is a new location, lots more space, shearing demos, sheep, loads more vendors and more. I'm teaching a workshop: A Spinner's Breed Tasting. Imagine a wine tasting flight (an oz or two of several wines) but for spinners. 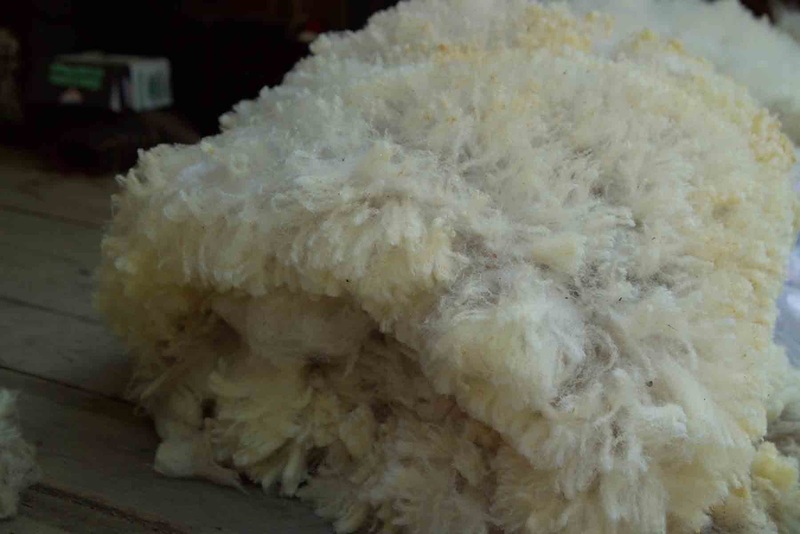 (Now, we won't be eating fleece! Just spinning it!) I hear there are still spots open so if you're local, please sign up soon. I'm getting all the different samples and hand out ready. It will be fun! I can't wait! I've also been getting ready for winter as only a knitter can. I've been designing a new sweater 'on the needles' (as I knit) this summer. 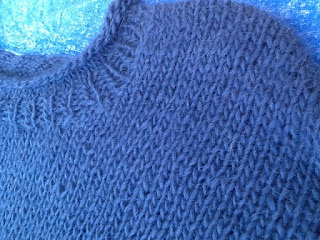 As one of my twins says, "it's a sweater for mommy" and likely to suit others as well, so I hope to write up the pattern soon. The best parts? 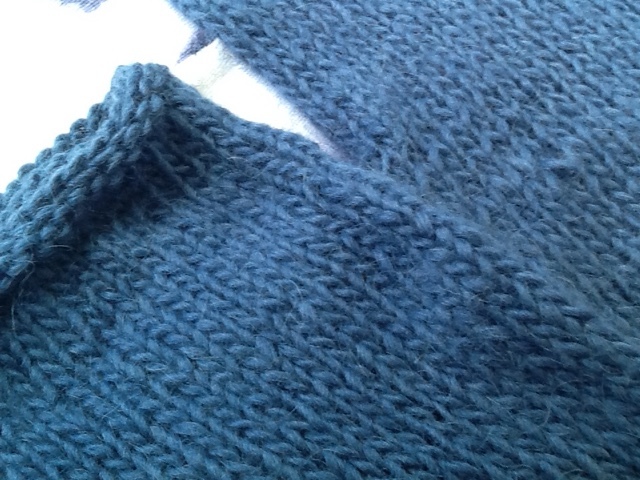 It's light and lofty, really fast on size 11 needles, and all in stockinette. It's over-sized and knit all in one piece. 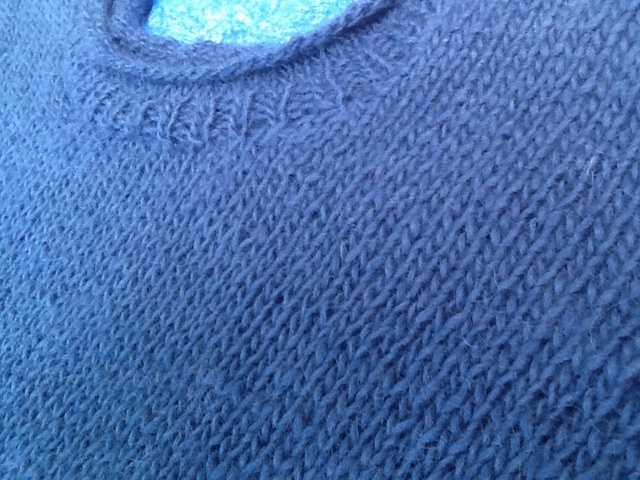 I could knit on it while I played soccer with my kids in the park. 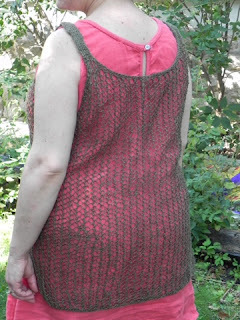 (cross body knitting bag, big blunt needles, and endless stockinette in the round...ideal for many hours of summer play.) Here are some sneak preview shots as the sweater blocked. 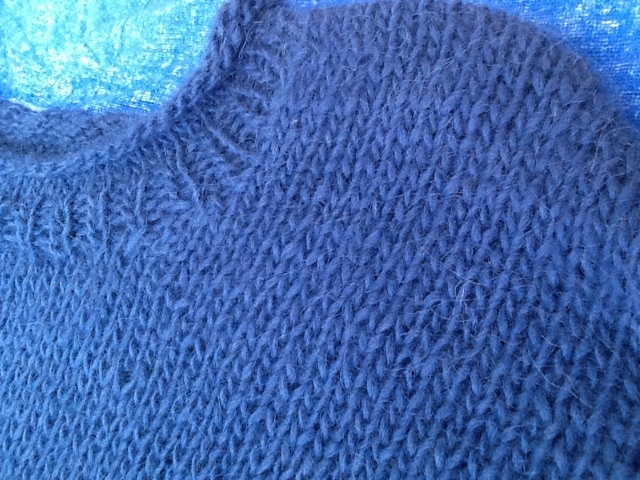 It's knit out of Alafoss Lopi, an Icelandic yarn that is perfect in all weights for winter here. Light, lofty and warm.... it's still warm here during the day, but winter is coming. I can feel it. Among other things, I spent hours outside in our front yard as my boys dug in the sandbox, in the dirt, in the garden, played and argued. Usually, I knit or spin on a spindle to keep from killing anybody, due to unnecessary sibling arguments or sheer boredom...I need to be close by in case of disasters. This year, I tried something new and attempted a big project. I wound 2 plies of handspun alpaca-silk singles (yarn) and 1 ply of handspun merino wool together into a ball on my nostepinde. (that long black wooden thing in the photo) I then used the nostepinde as a distaff, by tucking it under one arm. 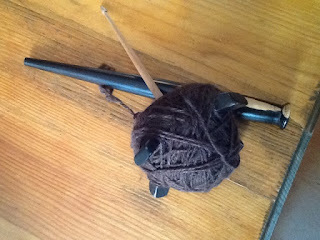 (usually my left, mainly by using my armpit) Then, I used that turkish spindle in the photo, and starting and stopping all summer, I made a big ball of three ply yarn. 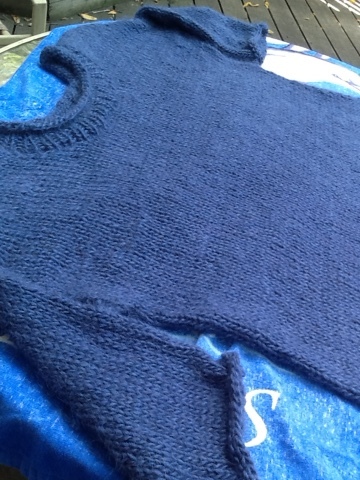 I skeined it up and measured it recently. It's about 110 yards of three-ply...all spun on a spindle. I also knit a new sample for my Turkish Lace Camisole pattern. I used Rowan Pure Linen, and I suspect I'll get good use out of this version! Of course, I finished it right before Labor Day, and it is already beginning to get cool here...there's always next year. I spent many hours on adventures with my twins, who told me firmly that their favorite parts of summer were spending time at the wading pool and with Mommy and Daddy. 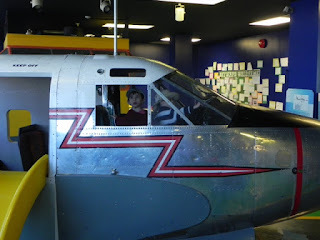 So, this summer, we went on lots of trips..including to the Aviation museum, the Firetruck Museum, the Railway museum, the zoo, the Assiniboine Park Conservatory, the gardens, the Forks, and of course, several different city wading pools and their adjacent sandboxes. Also, we're celebrating the start of preschool. Hurray! I have had 3 full days off of twin duty so far, and it has been nothing short of miraculous. Wishing you and your loved ones a happy, sweet, fulfilling, healthy and prosperous 5766. May we see more peace in the year to come. 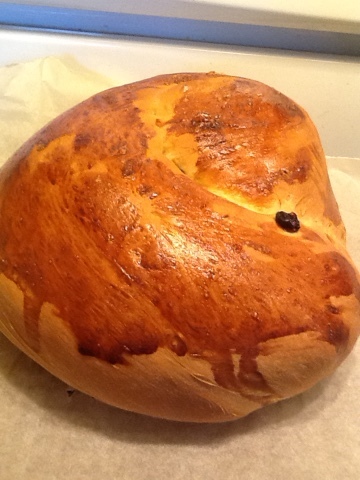 A happy and sweet new year!